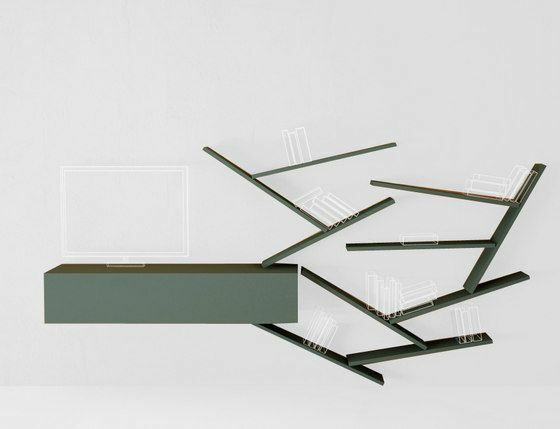 DiagoLinea emerged from the desire to create a system of dynamic lacquered shelves. It is a evolutive design with the flexibility to meet desires and needs that arise over time. Changing the geometric rules from the LagoLinea system, we have created a unstructured system where the shelves mutually support themselves, taking on unexpected inclinations that seem to defy the force of gravity, an effect accentuated by the insertion of invisible bookends. The innovative wall fastening lets the individual elements spin around, making it possible to create infinite configurations and transforming already-installed compositions in a simple, intuitive way. The system naturally integrates with the other products in the Lago family, creating compositions where the languages of the different products dialogue with one another in an always new way.